Inside the cave are a number of distinctive features, which have formed over thousands of years. They are all the result of water permeating the rock and dissolving the limestone. Large caverns can form underground in carboniferous limestone landscapes. They form when chemical solution is more active. As water flows underground it dissolves the limestone around it. The dissolved limestone (calcium carbonate) is carried away by the water in solution. The video below talks about the formation of caves. This will build-up over time to form long, thin deposits which grow downwards and look like icicles hanging from the ceiling of a cavern - these are called stalactites. Some drops of water fall to the floor of the cavern where they splash and evaporate. 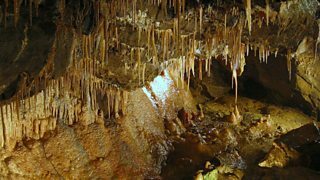 The splash spreads the deposit of calcium carbonate and as more and more calcium carbonate builds up on the floor, short, wide, dumpy features grow upwards from the ground - these are called stalagmites.